It’s been four days of awesome sailing, leaving competitors with unforgettable memories of sparkling azure blue seas, sandy white beaches and windswept ragged rocks. 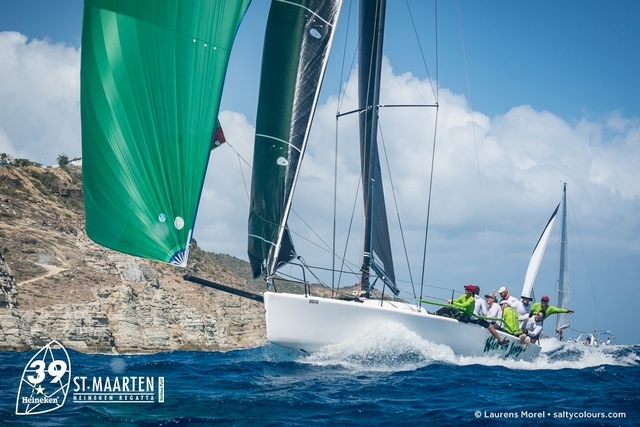 The St. Maarten Heineken Regatta delivered on its promise of four days of serious sailing, with upwind legs dousing the crews hiking on the rails with warm water from the waves breaking over them. Spectacular champagne sailing with roller coaster downwind legs, with a myriad of colourful spinnaker kites flying in the trade winds. For the sailors, the adrenalin of achieving the perfect start, the tension of getting the tactics right, the physical challenges of racing to the max, and the relief and jubilation as the boat crosses the famous Heineken finish line are all part of the serious sailing experience. And as the crew celebrate their day on the water, there’s the fun of the boats jostling to get through the lifting bridge, with music, on board dancing, outrageous dressing up, with the cheers, jeers and dousing from water pistols aimed at the boats from the crowds observing the procession from the Sint Maarten Yacht Club. In the lagoon’s marinas, the boats dock together, with new found sailing mates, cracking open ice cold Heineken and relaxing in the sun, chatting over the day’s activities before getting ready for the nights of Serious Fun. Crews, families and friends can savour the tasty offerings from local restaurants in the regatta village, sharing the banter with old friends and new, before the Regatta Village turns into the best festival venue ever, with the massive stage set up for an outstanding line up of artists playing serious funk, Caribbean jam, hip hop to reggae, and the final night’s legendary sets from Shermanology, Orange Grove and The Jacksons. 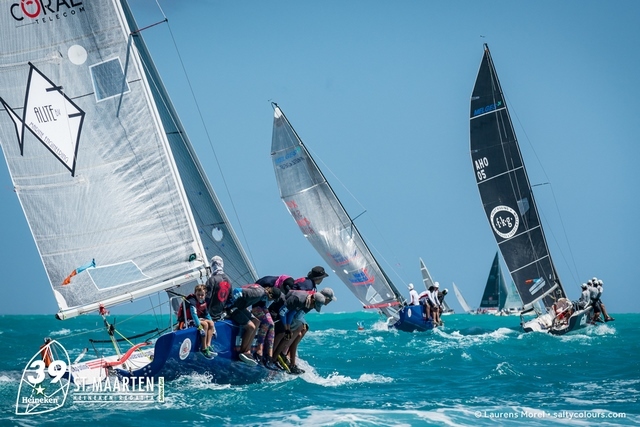 It’s the combined mass of all these elements that make the St. Maarten Heineken Regatta a unique event attracting more than 1500 sailors from 22 countries. But it’s the individuals that really count. While many boats really do have rock stars on board – from Olympic champions, Paralympians, world champion sailors, to renowned boat designers and yacht builders, to those who have battled the elements in the most gruelling round the world races, and those who have won their battle spurs in the boardroom – in this event, everyone is a rock star. And behind the scenes, all the race officers, committee boat crews, time keepers, mark boat drivers, jury, water taxi drivers, and the hundreds of volunteers who make this event happen, are all rock stars. 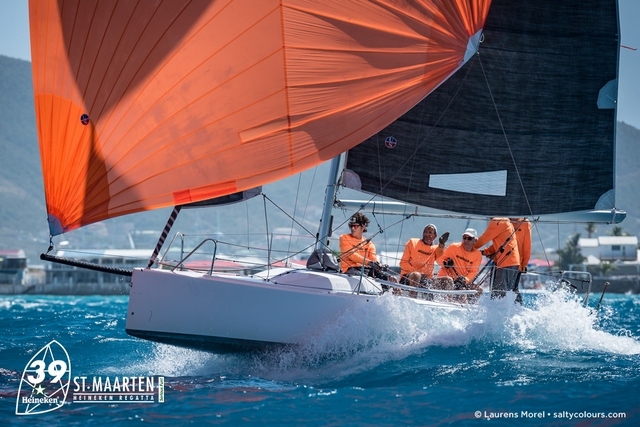 For the final day’s racing of the 39th St. Maarten Heineken Regatta, Race Director Paul Miller and his team devised a format that would create a wall of sails as the boats streamed downwind to the Heineken finish mark. Using two different start areas, the slower boats set off first, with all the boats sailing to the same first windward mark, before heading different course lengths along the south coast and for the faster, classes, up the east coast of St. Maarten, then turning back past Pelikan Rocks on a long spinnaker leg to the finish. “We’ve set courses of differing lengths, which will get as many boats as possible spinnaker sailing together back towards the finish, creating an amazing and memorable visual image of boats heading back towards the airport and bridge,” said Paul Miller. For many classes, this final race would prove crucial to the overall results. For some, their results had already ensured a place on the podium. With the 15-18 knot trade winds, nearly all the boats chose to close tack up the shore, with the shifting wind and choppy seas approaching the famous Pointe Blanche, providing plenty of opportunities to win or lose places. 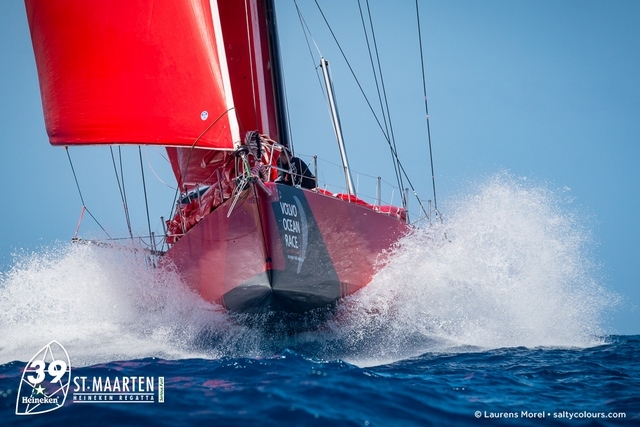 In the Offshore Multihull class, famous catamaran Tryst, helmed by Bernard Stoutenbeek, won with a clean sweep of first places. This is spectacular form for a boat which has been wrecked and rebuilt seven times after hurricanes. In the Island Time Class, there was a surprise win in today’s race by Dobro Dani, the cruising boat which is half way on her route from Croatia to Vancouver. Overall the class results were Avocation in first, Altair second and Cloe Dos third. In the Offshore Mulithull fleet, it was Team Brasil who got a first today, with Ineffable second and R-Six third – reflecting exactly the same order for the overall results. In Offshore Multihull 2 class, Spellbound won today’s race, with Arbuzov second and Sweet Spot third. This was also the final order overall for this fleet. 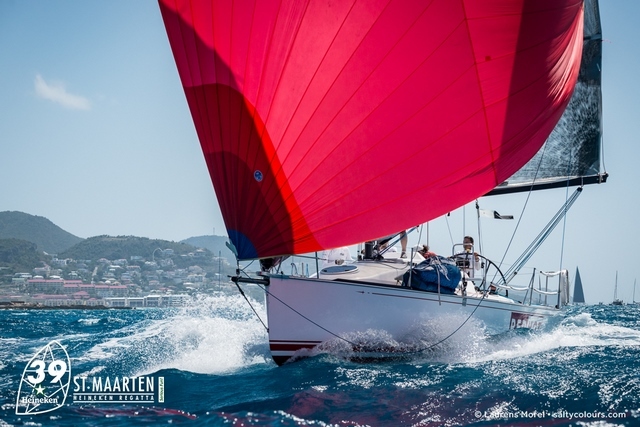 In Bareboat Class 1 fleet, Dutch team Semper Pro Grediens took second place, but this was enough to put them in the lead overall, with Marinero Sailing School Ukraine in second and Russian Federation crewed Lascaris third. 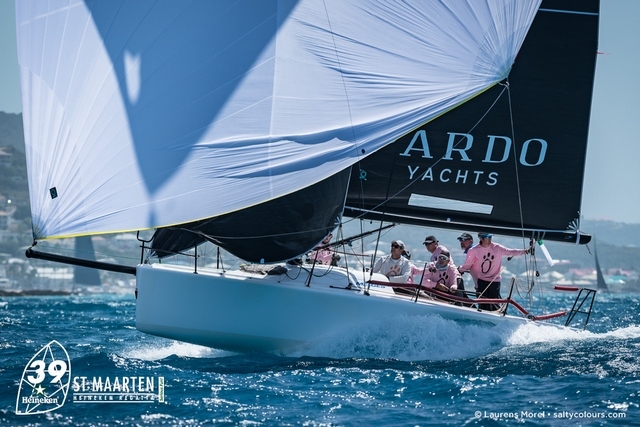 The Bareboat 2 Class had been dominated from the start by the KHS&S Contractors, who easily took the lead from Breeze Club, with Canadian team Nauti Canucks third. The three Melges boats in CSA Class 5 had been battling neck and neck all week. Today’s honours went to F.K.G who won the race with Team Island Water World second and Team Island Water World Too third overall. CSA 4 class was won by Whistler who took the bullet today to win the class overall. She was chased hard by Solstice, whose second place today gave her second overall, with Speedy Nemo third in class. At the prizegiving, Whistler was presented with the “Most Worthy Performance Overall” Trophy by the Minister of Tourism Stuart Johnson. The last few days had been tense for the leading boats in CSA Class 3, with all to play for in the final race. It was Touch2Play’s turn to shine, and her first place today gave her the overall podium spot in this class. Showing how competitive this fleet is, Liquid and Scarlet Oyster ended up with equal points, resulting in Liquid coming second overall and Scarlet Oyster third. For bridge crossing activities though, Scarlet Oyster definitely won the crowd’s approval; with helm Ross Applebey being towed through the bridge opening on a wakeboard, holding a can of Heineken! Dauntless romped to the podium in CSA Class 2, a good lead ahead of Sonrisa in second and Xpatriot third overall. 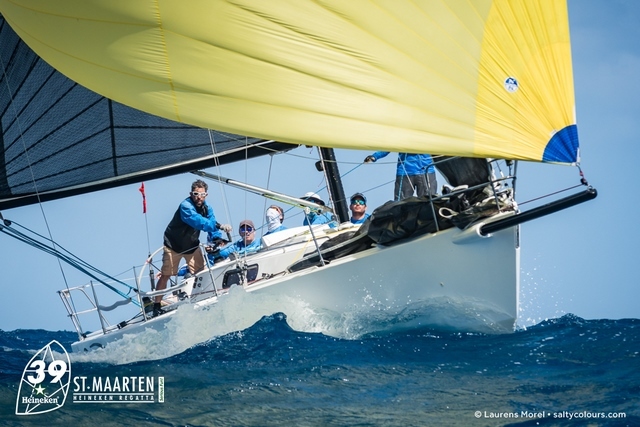 In CSA Class 1, every day saw exciting and close battles between the two leading Melges, Lazy Dog and Kick ‘em Jenny, with Antigua and Baruda crewed RP 37 Taz always in the thick of the racing. Today was no exception. On the long spinnaker leg back towards the finish, a spinnaker wrap on Lazy Dog contributed to her coming second in the race, but it was enough for her to retain first place overall, with the day’s winner Kick ‘em Jenny getting second overall and Taz’s fourth place securing third place overall. The ORC Performance Class had given spectators some of the most exciting starts to watch. Lady Mariposa retained her top class form, winning the race today to continue her clean sweep of bullets. Godspeed showed consistency throughout the regatta to achieve second in class overall with Aquis Granis coming third today, and third overall in class. In Ocean Racer Class 2, Made in Midi won today’s race, ensuring first place overall in this class, with EH01 in second and Avanti third overall, reflecting the order in which they finished today’s race. The spectacularly fast and furious Ocean Racing 1 class was dominated by Volvo Open 70 I Love Poland romping into first place overall, with Volvo 65 Ambersail 2 just nipping ahead of Sailing Poland, who ended up third in class. The Maxi class saw today’s race taken by Eliza Vastgoed enabling her to maintain her lead over Juno, who came second overall in class with Zampano third. And for the very largest and most beautiful yachts on the course, it was Selene who took line honours today to ensure she retained first in class, with the smaller and speedy Fling 16 getting second place today to achieve second overall in this highly competitive class. Swan 100 Varsovie and her smaller rival, Swan 80 Umiko ended the regatta on equal points, with Varsovie’s third place today just putting her ahead in the final rankings. 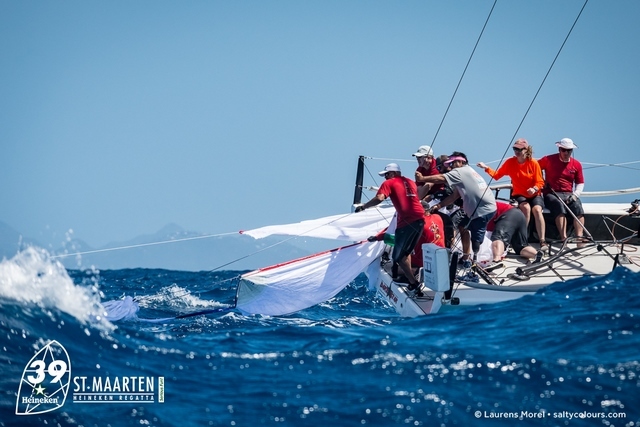 As the majority of boats were focussing on their fast spinnaker leg towards the Heineken finish, few could have missed the spectacle of six foiling kite surfers as they raced past the fleet, heading round St. Maarten in an anti-clockwise direction. The six kitesurfers, who had set off from famous kitesurfing beach at Orient Bay, were attempting to break the 1 hour 19 minute round island record set by catamaran Phaedo. The winner was Sebastien Queney from Guadeloupe who completed the rounding in 1 hour, 29 minutes and 32 seconds, closely followed by Marc Dubrulle, also from Guadeloupe, in 1 hour and 34 minutes, with local kite surfer Julien Quentel from St. Martin just minutes behind. With kitesurfing becoming part of the Olympic sailing classes in Paris 2024, this round the island record is sure to get smashed within the next few years! 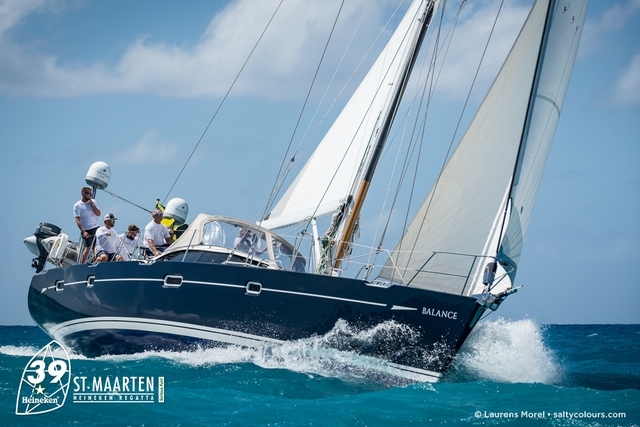 From the very modern to the classic, the final mention has to go to the majestic 12 Metre class, which had been two boat racing against each other during the 39th St. Maarten Heineken Regatta. It was Stars & Stripes who took first place overall from rival Canada II. The event has seen widespread praise, enthusiasm and overwhelming support for everyone involved, especially in the wake of recovery from the devastation incurred by Hurricane Irma. So the final words are from the sailors from over 22 many countries who make this regatta the legendary event that it has become over the last 39 years. The most frequently used phrases heard during the week include, “a great day sailing”, “it’s the best”, “awesome” and “we’ve had an amazing time”. For those intending to do some international bonding over the night’s Serious Fun, here’s some handy translations to help start the party!